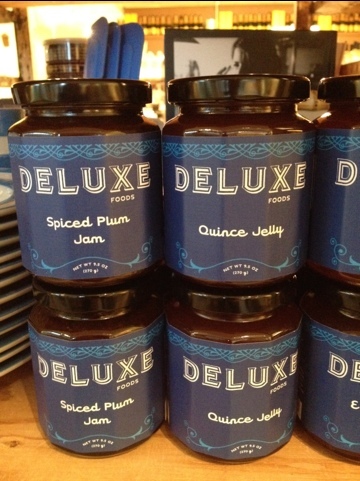 A new batch of jams, jellies & preserves from Seattle based über fab Deluxe Foods has arrived! 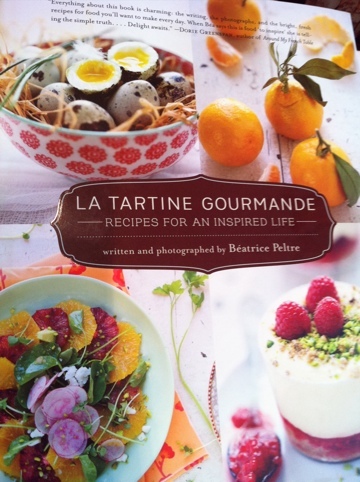 The brain child and passion of owner Rebecca Staffel, the award winning Deluxe Foods uses classic French recipes and then puts a little twist on it using herbs, liquors and clever fruit combinations. 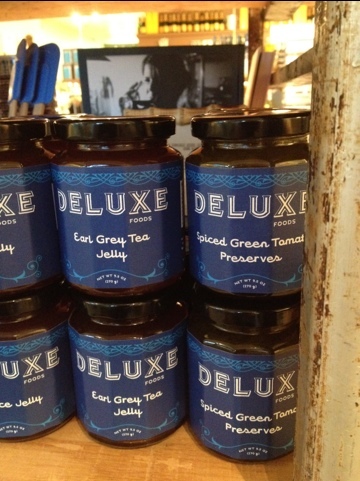 The Earl Grey Tea jelly is amazing on toast, whether with a cup of tea or not. 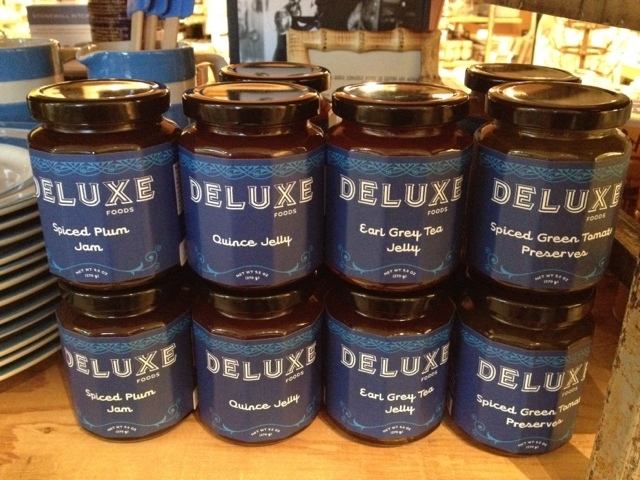 The Spiced Green Tomato preserves lovely with cheese and amazing added to a sandwich. The Spiced Plum jam makes for a great addition as a glaze to a pork roast. The Quince jelly ever so tasty on a scone. The happy packaging also makes all of the above stellar host/hostess gifts too. Check out the Benjamin Moore paint blog, www.colorchats.com and read the latest post written by Jane Dagmi. Jane is a writer, producer & stylist extraordinaire, who is also a contributing editor at Country Living magazine. 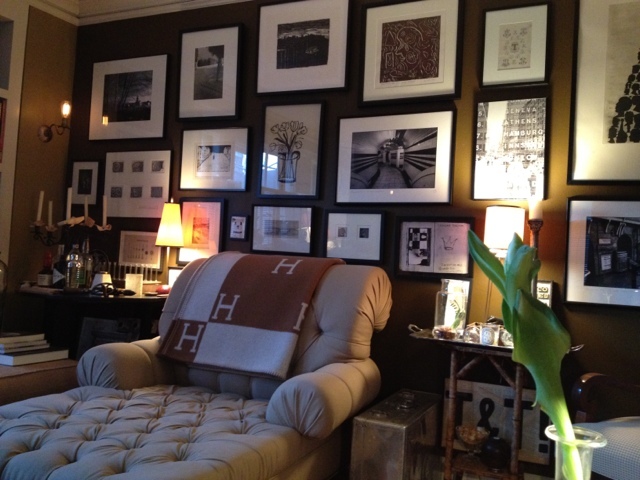 The post is ‘Six Colors Besides White That Will Flatter Art’ with our brown art wall at our home in The Gainsborough being featured. It is a fun look at some beautiful colors that really highlight artwork. It is always a fun thing to learn a new way to jazz up a kitchen classic. In this case, it is tuna salad. I was flicking through the channels the other evening, and made a stop at one of my favorite shows hosted by Ina Garten, the Barefoot Contessa. I have had the pleasure of meeting Ina on numerous occasions, and find her easy style incredibly comfortable and approachable. 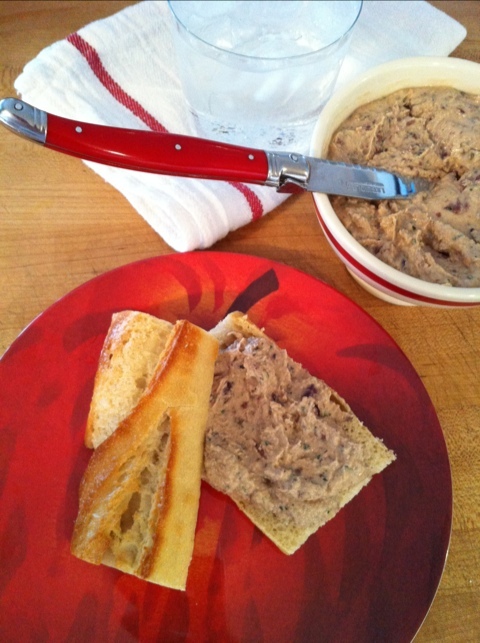 This tuna tapenade is no exception. She was making it as an appetizer on crostini. I thought it looked substantial enough to make it into a sandwich–which is what I did. It is a complex mixing of flavors, which really makes for one interesting and yummy lunch. Here is what I whipped up, with just slight variations to her recipe, as I was not needing to make as much as her she was making. 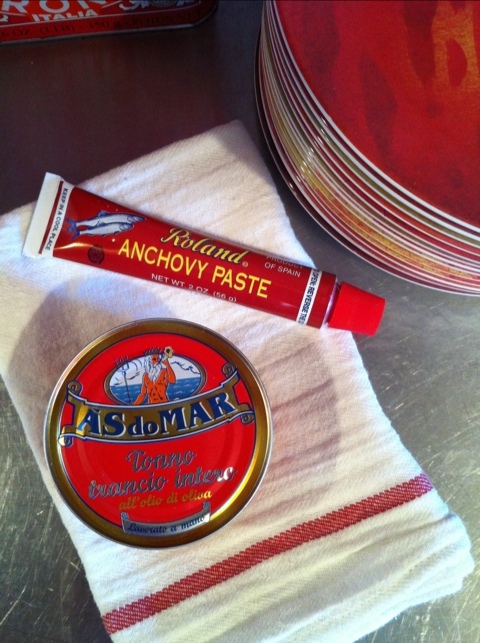 Drain 1 can of the best tuna packed in olive oil that you can find, leaving just a bit of the oil in with the tuna. Ina called for Italian tuna, but my grocer did not carry any. I did, however, find a really lovely alternative. Truly, use what you can find. Flake the tuna into a food processor with the blade attachment. If you don’t have a food processor, I would think this could also be done in a large mixing bowl, and just manually mix things together. It will be chunkier in consistency, but still delicious. To the tuna add 1 teaspoon of anchovy paste, a half a teaspoon of fresh thyme leaves, 1 tablespoon minced parsley, 1 minced garlic glove, and a tablespoon of fresh lemon zest. Pulse a few times to incorporate. Then add 2 tablespoons of freshly squeezed lemon juice from the lemon you just zested. Both the zest and the juice are a tad more than she called for, but I really like the burst of freshness the lemon adds to this. Next add a tablespoon of extra virgin olive oil, and 2 tablespoons of mascarpone cheese. You can now see why this is all so tasty, with such complex flavors. Pulse again till smooth. Almost there. Now add 2 tablespoons of pitted and chopped kalamata olives, and 2 teaspoons of drained capers, along with a pinch of salt & pepper. Pulse again, till all is mixed in. Transfer to a bowl, wrap, and let sit in the fridge for at least an hour so it cools and the flavors have time to marry. I spread it on a baguette for a simple sandwich. The flavors are out of this world. I hope you enjoy. Thanks Ina! I hope all is well in your world. Please send my best to Barbara! 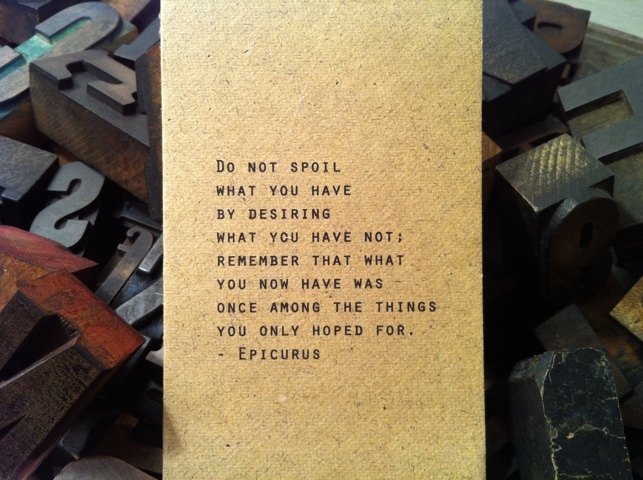 I found this card and thought the sentiment rang so true. Cheers to all the good things that make up our day. Wishing everyone a lovely Oscar Sunday. 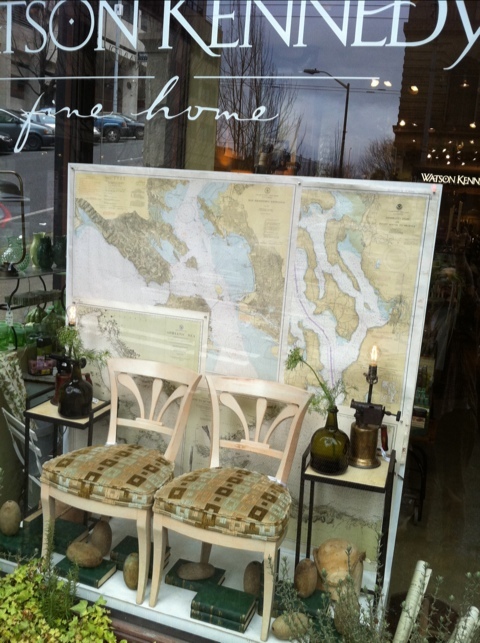 It was an early morning start yesterday, as our goal was to give both windows at the Home store a complete re-do. 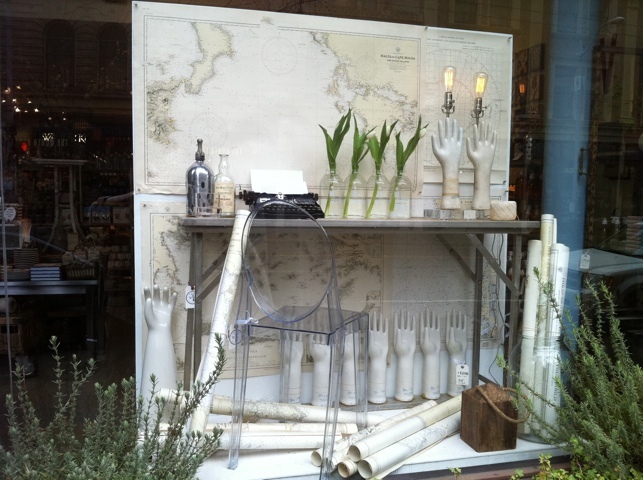 Display & design are 2 aspects of owning retail stores that get my heart racing the quickest. To be able to create a completely new look in a matter of hours–I just love it! With Amy & Heather by my side, we raced right through getting the windows emptied and cleaned. Now onto the fun part. For the first window, I really wanted to have the new console take center stage, and treat it like a desk. The Lucite ghost chair working perfectly to almost just disappear, and not block things. 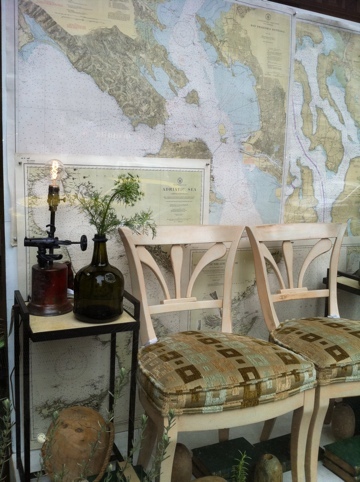 The vintage charts and maps are a new find. More on those for a later post. I acquired 100’s of them, so I really wanted to highlight these too. We treated them almost like wallpaper, covering the entire wall. 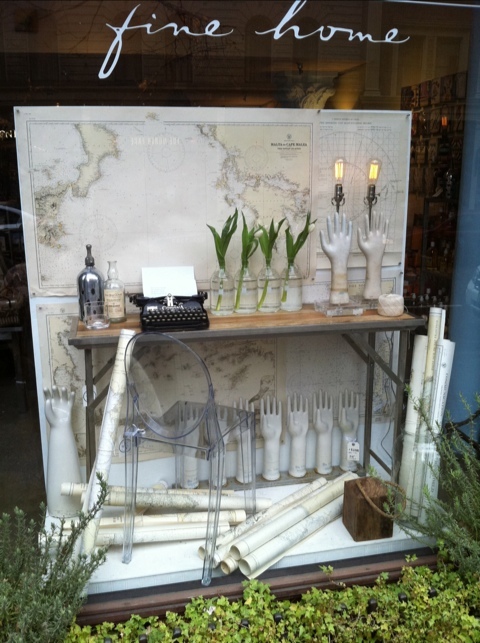 The Lucite based vintage glove mold lamps had been waiting for just the right spot, as well as the vintage typewriter. I like to create a story for each window in my head, before it begins. It ended up just as I had pictured it. We did the same wall treatment for the second window. 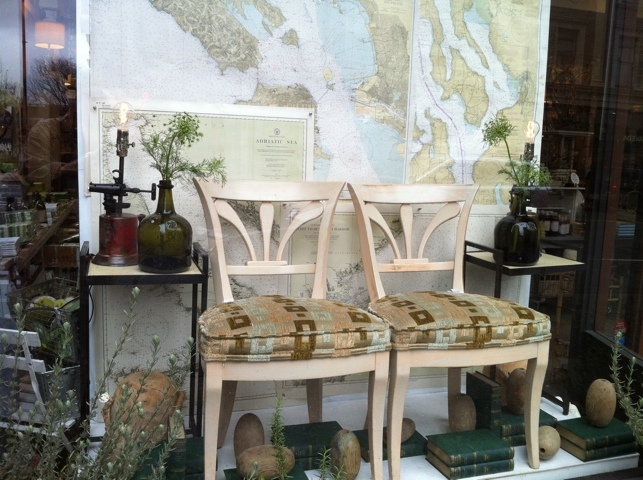 The coloring of the maps working nicely with the fabric on the vintage chairs. The little side tables are new. I found these at the show in New York last month. They are holding lamps made from vintage soldering irons. A set of green vintage Harvard Classics books were set about, as well as vintage floats. Fresh windows just re-energizes things. I love how customers come in and mention them right away. It was a perfect way to start a Friday morning. A few flower stems were added, and we were off and running. A few months back, I wrote about the contents of my Filson bag that I carry with me each day, as requested by a customer. In it, was a small travel tin of Maldon sea salt. 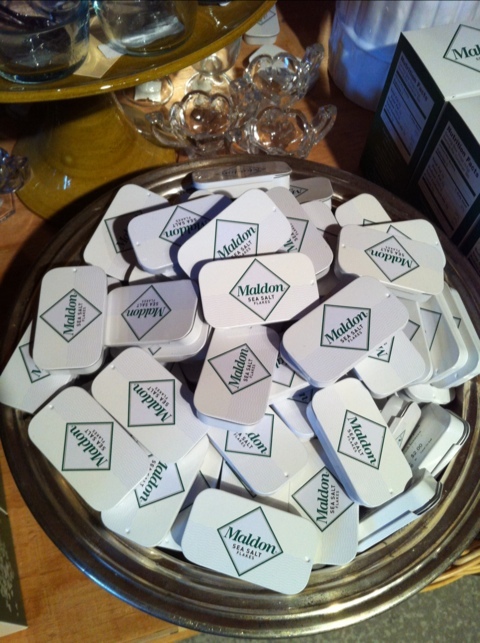 It had been a gift from the company that I buy the boxes of salt from for Watson Kennedy. We received so many requests regarding those tins, that said lovely company has decided to offer the travel tins, and in turn, we will now be offering them at the shop and on the website. As I wrote in that post, good salt is good salt. Having a small pinch to add to your meal when you are out & about, far surpasses normal table salt. Founded in 1882, England’s Maldon Salt Crystal Company still draws salt from seawater using traditional long-handled rakes. The result is the world famous chunky, pyramid shaped crystals. A happy Friday to one and all! 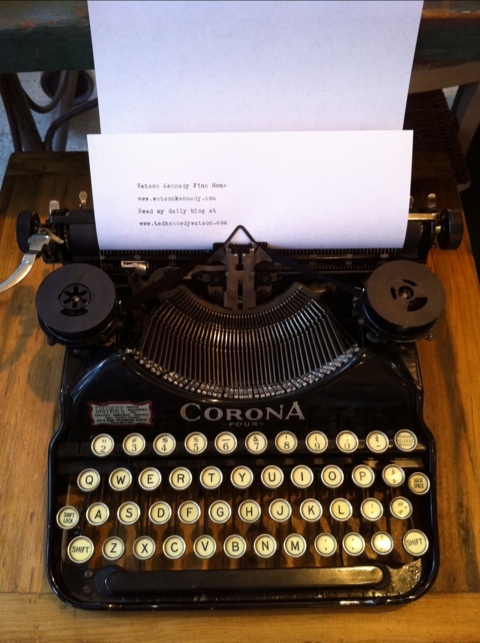 We received the first of an assortment of vintage typewriters that will soon be interspersed throughout the shops. 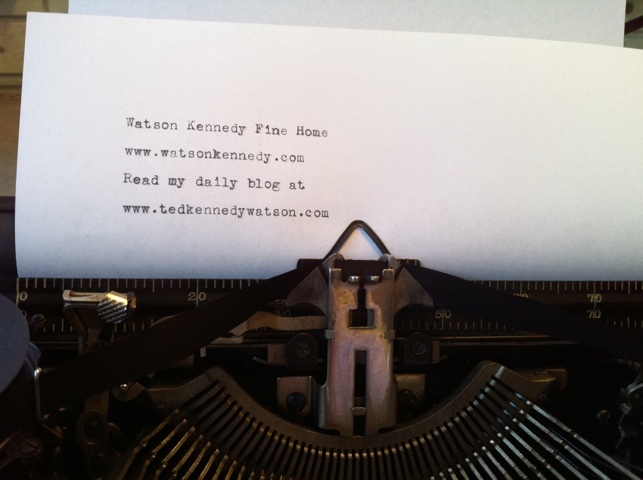 Watson Kennedy has always had a small variety here and there, but I have really seen an uptick in interest in the past year. This prompted me to source both refurbished and non-refurbished models. Some folks just like the idea of having a vintage typewriter for display, and are not really interested in using it. Others like the idea of really tapping away at it, and actually using these glorious machines. We will now be covered on both bases. Pictured here is a Corona Four, which was released in 1924. The sound of me tapping away on it yesterday stopped some customers in their tracks. There is just something about that sound, and the feel as your fingers hit the keys that just brings you back. For some this might not be a good memory, while others like me, are brought back to a happy time. I associate it with my Dad. He was a single finger typer, but boy was he fast. I would sit at his office waiting for him to take me to a tennis tournament, while he finished his work with that sound wafting in the air. More models will be arriving in the coming weeks. Boxes and goods are arriving daily from orders I had placed at the show a few weeks ago. A quick walk around the shop and I snapped a few new favorites. It is always a treat seeing the things on the shelves and mixed into displays, as it really does bring them full circle, from when I placed the order and try to visualize how and where they will end up. Of course, the end result is that someone will fall as madly in love with something as I have, and enjoy it immensely. That is always my hope & goal. 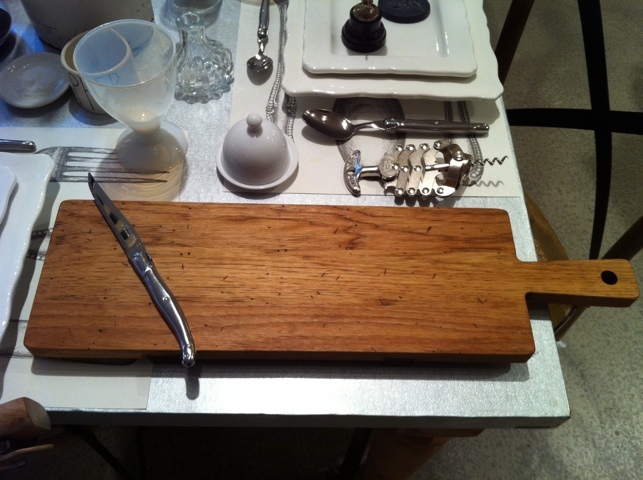 This artisan cutting board is new, with an old soul. 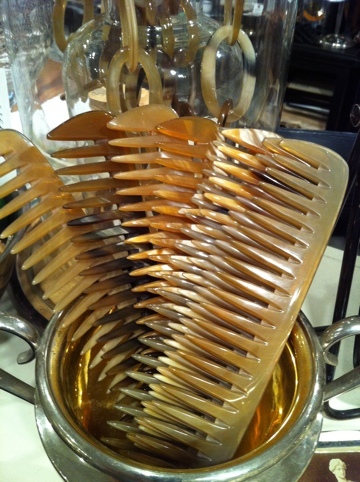 I am crazy for these horn combs. They have a Downton Abbey feel to them. 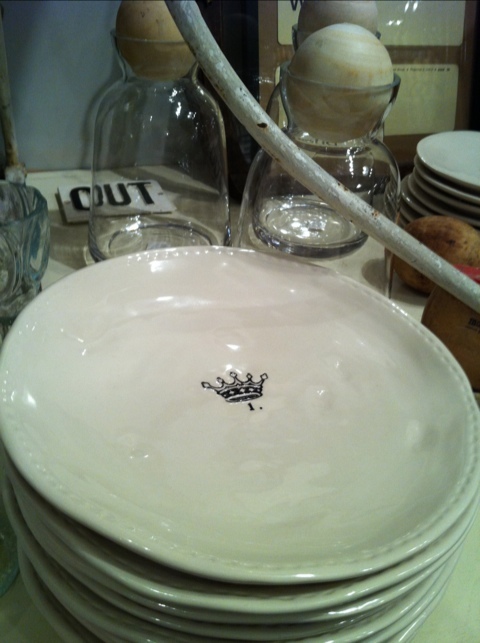 A variety of crowns embellish these plates. These made my heart sing! 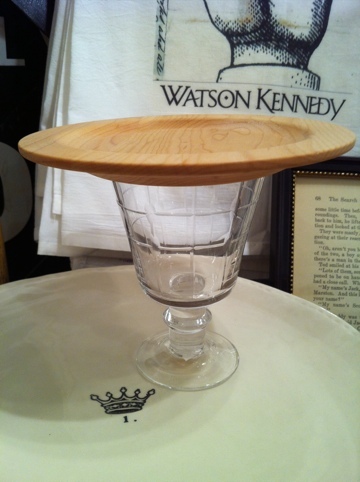 This is a wood plate that is designed to sit atop a wine glass, so when you are standing at a party, you can have it rest on your wine glass and have a free hand to eat with. So clever. 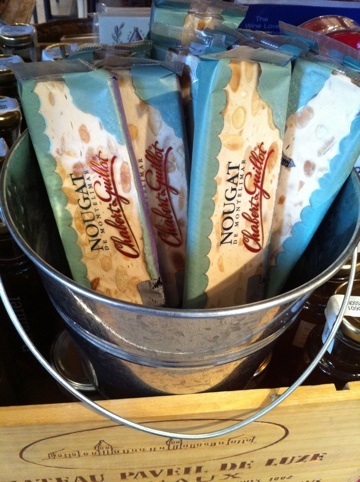 My favorite nougat candy bar from France. I crave these when I am vintage shopping in Paris. 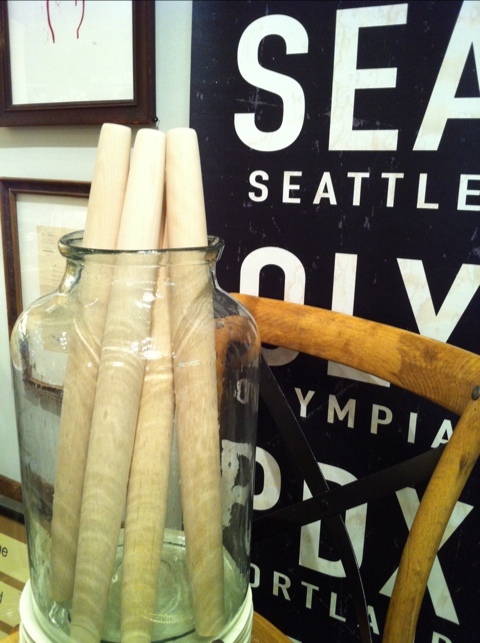 French rolling pins–such beautiful objects, as well as functional. 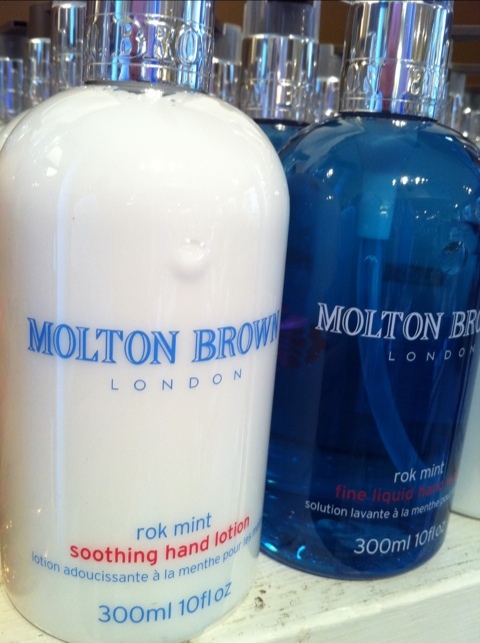 A new scent from London based Molton Brown. Splendidly written and photographed by the author of her much read blog, by the same name. And lastly, an incredibly soft throw blanket. 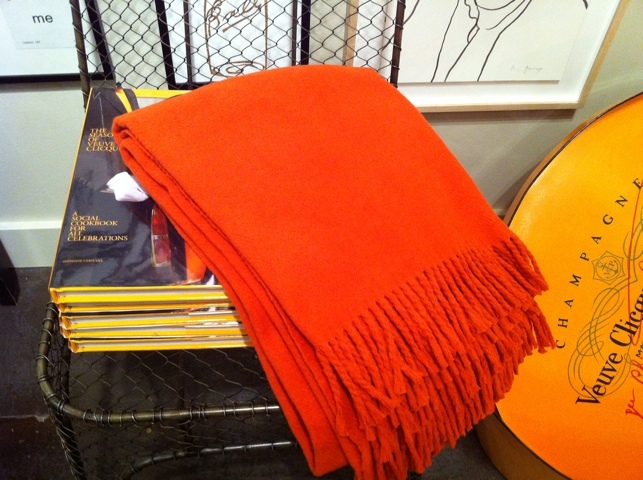 I zeroed right in on this Hermes-y orange, which I can never get enough of. 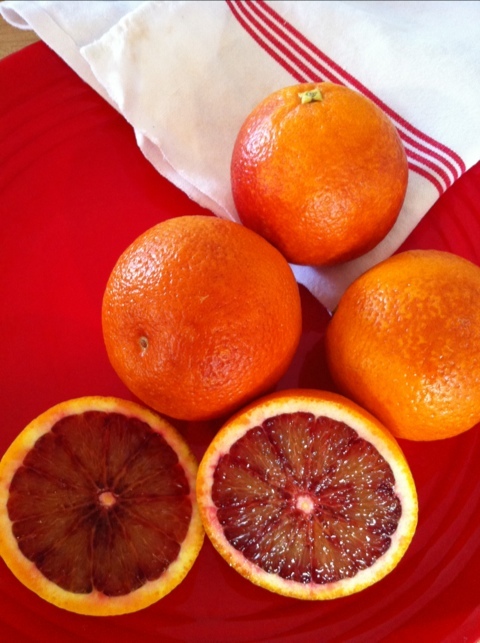 Blood orange season is in full swing, with the beautifully colored fruit gracing the bins at the Market and grocer. I picked some up the other day for snacking, as well as making a simple vinaigrette. 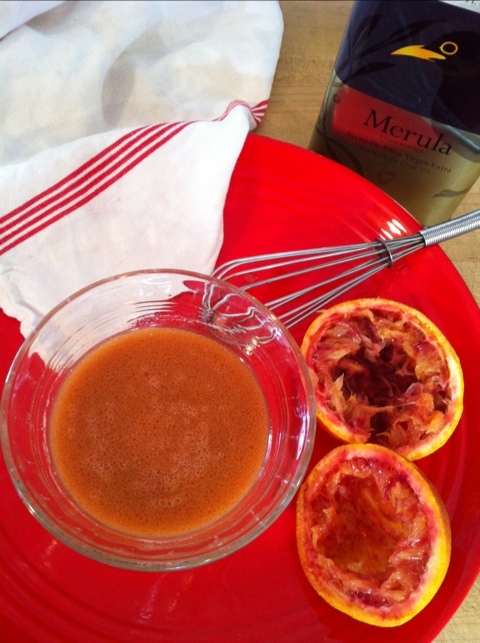 The slight raspberry flavor of the fruit makes for a sweet dressing. Plus, I love the color. Juice a blood orange. You will need 3 to 4 tablespoons of juice. Add that juice to a small mixing bowl. Then add a healthy teaspoon of Dijon mustard, plus 2 pinches of salt & one of pepper. Slowly whisk in a half of a cup of the best extra virgin olive oil you have. That is it. Simple as can be, and as yummy as can be. 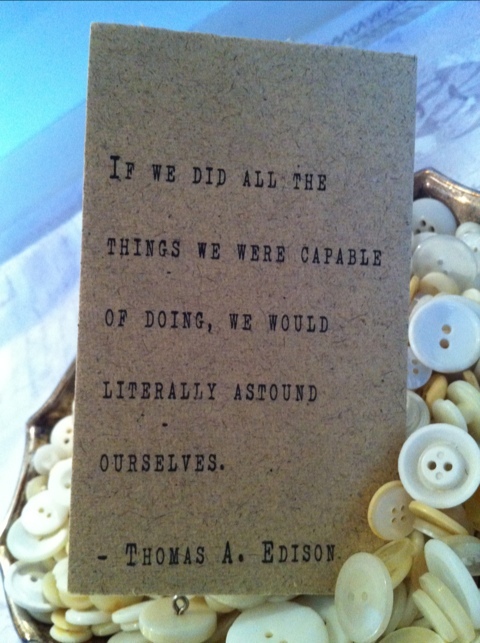 An energizing and motivating thought as we begin our Monday.